A great fun filled Sunday morning at Catalina State Park celebrating 15 years of Take a Hike for Bag It ! Whether you joined us for a beautiful scenic morning, sponsored a bag from home, or were with us in spirit, we appreciate your support! Dan Marries, Tucson News anchor, welcomed our hikers back to the Ramada that was rocking to the music from LatinoBazaar and encouraged them to join in on all the fun and activities! Guests enjoyed their meal choice from Gigi’s food truck, a chance to win fabulous prizes in the Raffle, Silent Auction, and Spin the Wheel and played “Where’s the Bag It bag.” Sandra Valenzuela, a volunteer that has been with Bag It from the very beginning shared about how she got started and why she continues to volunteer and support Bag It. We were able to say a big THANK YOU to founding board member, Dr. Don Brooks, who recently stepped down after 15 years of board service (don’t worry we’re going to keep him involved in some aspect) and acknowledged eight sponsors who have supported Bag It for all 15 years. With the help of 55 wonderful volunteers, 150 awesome attendees, and 19 generous sponsors, Bag It was able to raise over $38,000 to help EDUCATE, SUPPORT & EMPOWER those impacted by cancer. These donations help ensure that anyone who wants a Bag It bag can receive one at no charge. If someone does not receive a bag from their medical provider and are unable to make a suggested donation they can call us and because of YOU we are able to send them a bag to help them be informed and feel empowered to be their own advocate. 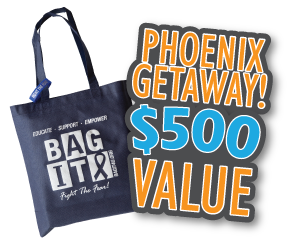 Thank you for providing 60 individuals with cancer a bag through your Sponsor a Bag donations. And the winner is . . . Rosa Rousseau. Congratulations Rosa! We hope you have a great time when you journey to Phoenix.